How to do Spring fashion when it’s Autumn outside! Top tips for wearing your spring clothes when the weather is cold wet and miserable. What a crazy rainy day here in the UK – where has the sunshine gone?! Wear a colourful raincoat – find a mac in a great colour for you – bright red, orange, pale blue or coral – an instant splash of fun when all around is grey. 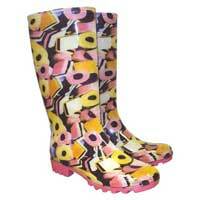 Invest in a pair of colourful &/or patterned wellies – practical and stylish – who cares if there are puddles! Wear your coloured jeans with these wellies or even with your winter boots, although beware, black boots might be a bit harsh with some of the warm colours – try tan or brown instead. Use colourful accessories – scarves, necklaces and bracelets. Layer up with lots of thin layers and cardis rather than a thick wooly jumper. Rest assured summer will eventually come around so we can wear our sandals and flip flops again – just don’t ask me when! ← Are You Under Accessorised?